Peter King was buried at Plaxtol Church on 22 April, where his father (?and grandfather) was also buried. Although the family lived in Plaxtol for a century, Peter’s work as a blacksmith was nearly all in Leigh. The King family had been blacksmiths for generations. They traced the family trade back to the 1600s. Peter’s grandfather put shoes on the horses that pulled ‘buses’ round London in late Victorian times but Peter’s father worked first for Hyders forge in Plaxtol before moving to work for the Bullingham family at the Leigh Forge on the Green where Peter was trained after studying at the Tech in Tunbridge Wells. When the Bullinghams sold the Forge in 1972, Peter started his own blacksmithing business in an old Nissen hut at the back of Moon’s Garage which in due course became Chequers Garage. (When Mike Peters sold Chequers Garage to Alan Rance, who was starting Fairlawn Garden Mowers, it was part of the deal that Peter stayed on). Over the next twenty five years Peter made wrought iron items for large numbers of people in the village – no job was too big or too small – and in the roasting heat of the Nissen hut you could find Peter working on curved banisters for a millionaire’s new house or work for a cathedral or mending a spade for someone in the village. He was one of the blacksmiths who worked as a team on the riverside gates at the Globe Theatre – opened by the Queen in 1997. By the late 1990s Peter was doing work on steam engines for Bob Ashby, the force behind the Tunbridge Wells to Eridge railway line and as Bob had some space in his Chiddingstone Causeway yard, Peter decided to move village. His new workshop, which was indeed larger, was equally ramshackle but allowed for even more and larger things to be left there. Outside would be the kit car that Peter had built on a Morris Marina chassis and, inside, the quiet but ever-cheerful Peter with a roaring forge fire. Some years ago Peter became ill and was looked after with great tenderness by his life-long partner, Doris Peacock. His final illness meant hospital on 15 March from which he never recovered. 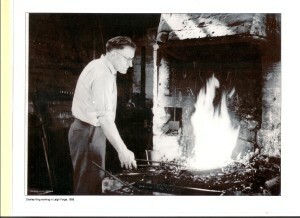 All Leigh people and his many friends in the British Artist Blacksmiths Association of which he was Treasurer for many years will be sad that he is no longer with us. Below is a photograph of Charley King working at Leigh Forge in 1958. Charley King was Peter King’s father. He worked mainly at Hayden’s Forge in Plaxtol, but used to help out at Leigh, often on Saturdays.